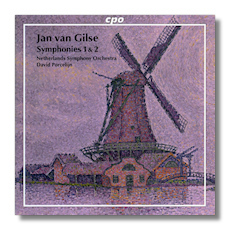 Even in his native Netherlands, Jan van Gilse (1881-1944) is largely a forgotten composer. In his excellent booklet note, John Smit blames Gilse's neglect today on the fact that few of his scores were published – but then why weren't they published in the first place? Gilse was trained as a conductor, and it was left to him to conduct his own orchestral works. After he died of cancer – and from being hounded by the Nazis for his work in the resistance movement – his music lost its most active (if not its most disinterested) advocate, and fell nearly into complete oblivion. This new CD appears to be the best thing that has happened to van Gilse's legacy in a long time. I was surprised to read several negative reviews of this disc, however; Gilse's symphonies have been denigrated by several Internet reviewers as being dull or unmemorable. I don't agree. What about the Scherzo of the First Symphony, for example? Granted, van Gilse was not much of an innovator in these two youthful symphonies, which premièred in 1901 and 1902, respectively. Still, the music is very attractive, in a Germanic or Austrian sort of way, occasionally Brahmsian, sometimes suggesting a youthful Bruckner, and at other times suggesting a Dutch Elgar. Both of these symphonies are idealistic in tone, even heroic, which is just what one would hope for in a composer in the springtime of his life. The First was written as an examination piece for the Cologne Conservatory. The Second came almost immediately after, when van Gilse went to Berlin to study with Engelbert Humperdinck. Its harmonic language is more advanced, yet still highly conservative. CPO doesn't indicate whether or not these are première recordings, but I believe they are. Apparently the label plans to record van Gilse's three remaining symphonies (the last is incomplete) and his opera Thijl, based on the Till Eulenspiegel character made musically famous by Richard Strauss. Dutch conductor David Porcelijn brings out the music affectionately; if this isn't first-class music, his conducting isn't letting on. The Netherlands Symphony Orchestra has been recorded in its home, the Musikzentrum in the city of Enschede. The orchestra's sound is well-blended and polished, and one feels that it is making the best case possible for van Gilse. I am looking forward to hearing the next CD in this series.